We present a completely new developmental and educational application for your baby with unique capabilities for flexible configuration and use of your own content! For the first time it is all available in one app! More than 450 interactive flashcards with high-quality pictures in HD, sounds, written words and professional audio from native speakers. Find out your baby's interests, customize the application anyway you like by adding new categories and flashcards. 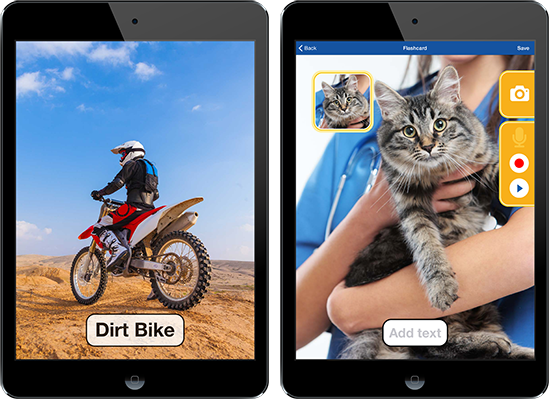 Create your own flashcards using photos of your family, your favorite pets, using whatever you would like to use in order to teach your child! You can also record your own voice or sounds for your child, it's all very simple! More than 450 interactive flashcards in 8 categories: The World of Animals, Birds, Wild Animals, Musical Instruments, Home, Vehicles, Nature and Kids World. The application includes five basic categories (The World of Animals, Vehicles, Wild Animals, Musical Instruments, Home) and the ability to add more. Each flashcard includes up to 5 pictures in high quality HD. For the first time it is simple and easy to create and edit your own interactive flashcards. You have the ability to manage categories. Add new categories, create your own category, change the order of the categories as you wish. There are 2 modes of the application. The intuitive and easy viewing mode by simply touching the flashcards. As well as learning mode with questions and choices of flashcards. It is a unique opportunity to find out the preferences of your child! See which flashcards and categories attracted them the most. There are specially selected sounds of animals, birds, musical instruments and much more. The voiced flashcards are professionally recorded with native speakers. In the process of developing the application adaptations were programmed, taking into consideration the child's perception and interaction with the phone or tablet, including lengthy pressing of the screen by accident. There are advanced settings of the flashcards viewing mode. 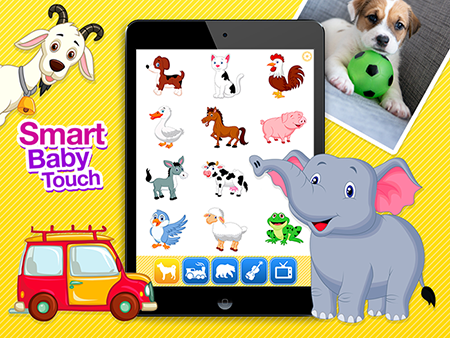 Smart Baby Touch HD is $2.99 and designed for iPhone, iPad & iPod Touch and requires iOS 6.1 or newer. iSelect Apps is a young team of specialists, developers and designers whose common goal is to create the best educational and learning apps for children and their parents. Apart from developing new ideas and products, we pay a lot of attention to our own beloved children. So, like many other parents, we are concerned about the overall education and development of small children. Combining the efforts, feedback and recommendations of other parents and learning and development specialists, iSelect Apps creates really useful and popular apps which are chosen by parents and loved by children all over the world.